Apparently I look like a Wookie, or so I was told by Oopla (below, left) as she picked me to go onstage to start the event. I was told to do my best Wookie impersonation! 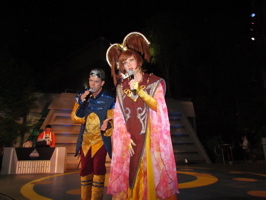 Snig and Oopla (below, right) are found each night of Star Wars Weekends entertaining guests at the Hyperspace Hoopla. 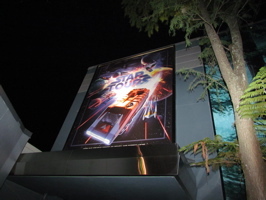 The new advertising for Star Tours (below, left) is high atop the Star Tours attraction. 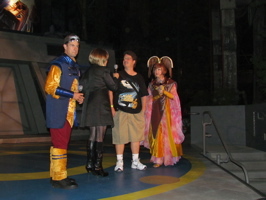 Mon Calamari guards (below, right) look over the crowd. 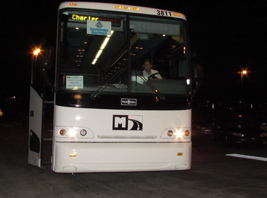 Departure times (below, left) are listed on this new high-definition screen, which also displays advertisements and information. 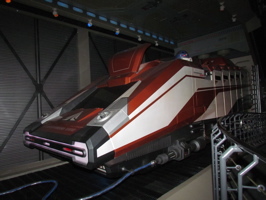 The new Starspeeder 1000 (below, right) replaces the older Starspeeder 3000 model. 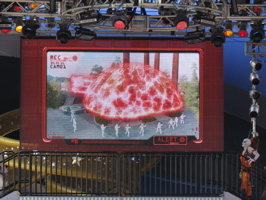 The new version was introduced a year ago (in smaller form) at Star Wars Weekends. 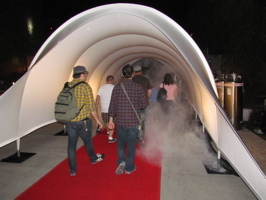 Guests were treated to a wide variety of Star Wars walk-around characters, many of whom rode with us! 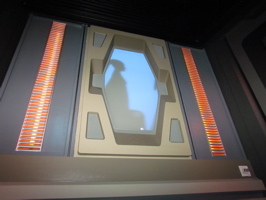 Princess Leia walked past us in the Star Tours queue as we were taking photos and video (below left). 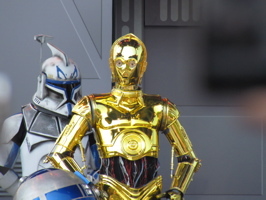 C3Po is still in the queue, but with both gold legs – not the silver one as he had previously (below, right). 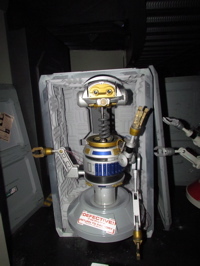 Rex is back in the Star Tours queue (below, left) with a sign that reads “Defective, Return to Factory“. 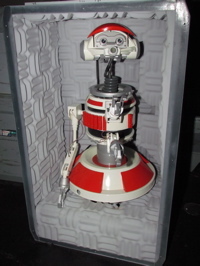 There are other droids in this area that are similar to Rex (below, right). 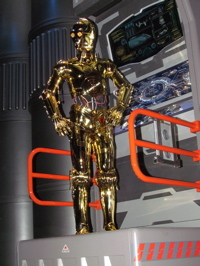 Rex was the captain of Star Tours before this refurbishment, C3Po is now in the driver’s seat. 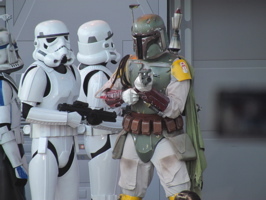 Boba Fett (below, left) looks down on us as we entered the queue. One of the most fun parts of the queue is the baggage droid (below, right), who checks the luggage as it’s scanned (below, right). He comments on each piece of luggage as it goes through, with sometimes amusing results! 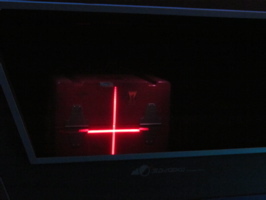 Luggage is scanned (below, left), and contents shown on the screen (below, right). 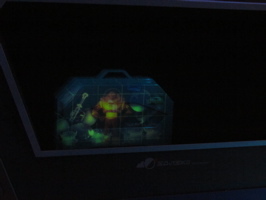 We saw a wide variety of items being scanned, both Disney and non-Disney! 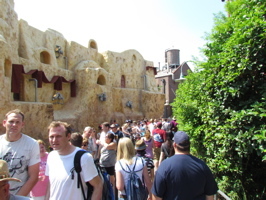 Star Wars characters walk past a window above the queue (below, left). 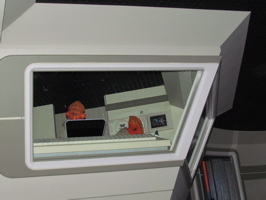 Another droid scans humans as they walk by (below, right), with the verbal scans being visible just as the are on Test Track. 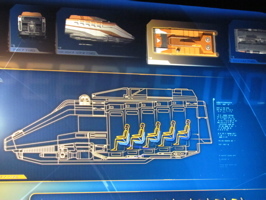 Near the entrance to the queue, there is a diagram of the new Starspeeder 1000 (below, left). 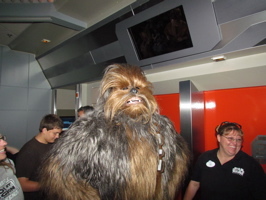 Chewbacca joined us for our last ride of the evening (below, right). He was quite the celebrity in the module, with everyone pointing cameras his way! 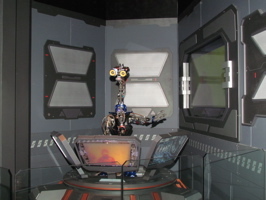 Video #1 – Star Tours Meet-Up Opening Day Highlights with Queue, Characters and More 5/20/11 Disney World – This video was taken at a meet-up (hosted by Disney), and includes footage of the updated Star Tours queue as well as of the event. 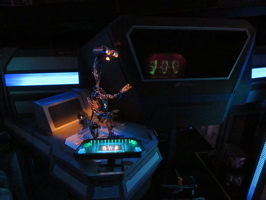 During the evening there was a special presentation about the re-imagining of Star Tours. 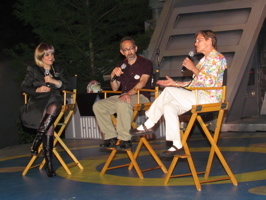 Guests asked Imagineers Kathy Rogers (below, right) and Steven Speigel (below, left) questions about the updated version of Star Tours 3D: The Adventure Continues. 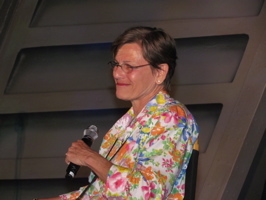 Video #2 – Star Tours Imagineer Interviews 5/20/11 Disney’s Hollywood Studios (Meet-Up) Star Wars Disney World – Guests ask Kathy Rogers and Steven Speigel questions about the new Star Tours at Walt Disney World’s Hollywood Studios. 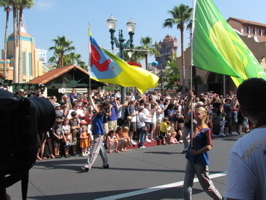 There was a dedication later in the morning, featuring Star Wars creator George Lucas and Disney President and CEO Bob Iger. 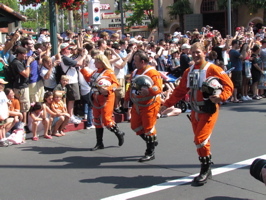 An abbreviated version of the Star Wars motorcade (below, left) proceeded down Hollywood Boulevard (below, left and right). 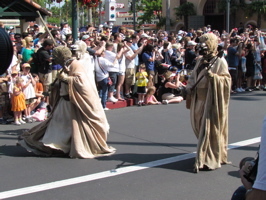 Tusken Raiders (below, left) walk down Hollywood Boulevard. 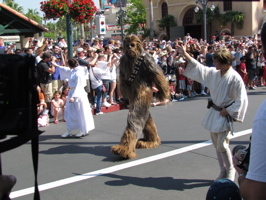 Princess Leia, Chewbacca and Luke Skywalker (below, right) wave to guests along the motorcade route. 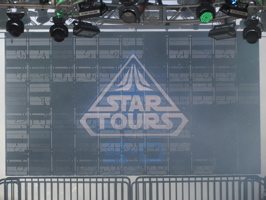 The Star Tours logo (below, left) is shown on the screen before the dedication. Cameras are hoisted in the air to get photos of the proceedings (below, right). C3P0 looks at the large crowd gathered for the event (below, left). 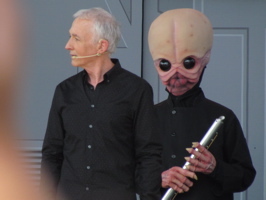 Figrin D’an and Anthony Daniels (below, right) join the group of Star Wars celebrities and characters onstage. 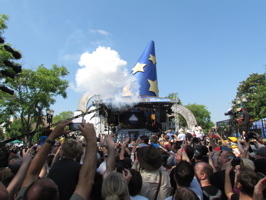 Darth Vader (below, left) made quite the entrance walking out onstage, attempting to shut down the proceedings with energy shields (below, right). 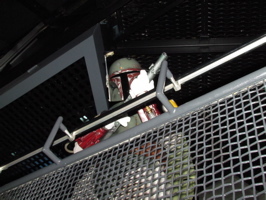 Boba Fett and Stormtroopers (below, left) guard the stage. 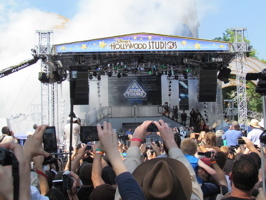 Fireworks were set off in celebration (below, right) of the updated Star Tours attraction. 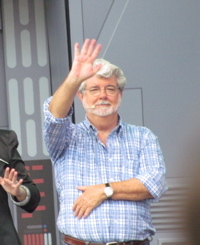 George Lucas (below, left) waves to the crowd. 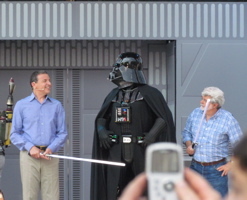 Walt Disney Company President and CEO Bob Iger wields a lightsaber as Darth Vader and George Lucas look on (below, right). 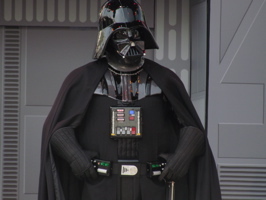 Iger told Darth Vader, “prepare to meet your maker“. 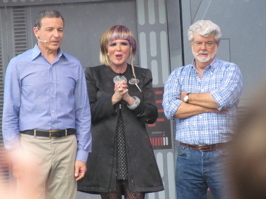 Bree Starliner, Chief Holocommunications Officer, stands between Bob Iger and George Lucas (below, left). 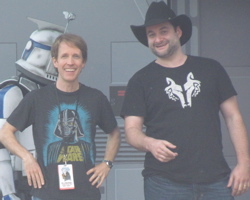 The multi-talented actor James Arnold Taylor from The Clone Wars (below, left) joins Dave Filoni, who directs the animated show. 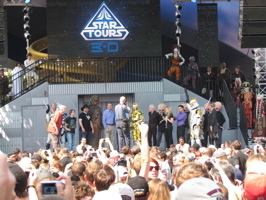 A wider view of the stage reveals the variety of characters, actors and others from the Star Wars galaxy (below, left). 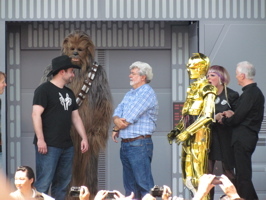 George Lucas talks with Dave Filoni (below, right), as Chewbacca and C3P0 look on. 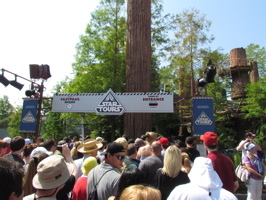 The Star Tours queue stretched from the Star Tours attraction (below, left and right) to the Streets of America. We didn’t see the queue filled and it likely wasn’t, but Disney was ready for long waits. The longest wait we ended up having was for merchandise, at nearly an hour and a half! 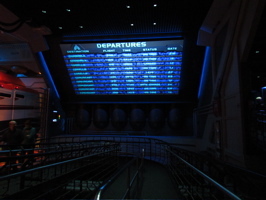 We had a great time celebrating the opening of Star Tours, here is to 25 more years of adventure!